With all of the horrific news that has been seen on the television lately, we're apt to hold on to any little piece of cheer, such as the festive holiday commercial for the Apple iPad mini that has just been placed in rotation during your favorite prime time shows. As we've seen with recent spots for the Apple iPad mini, there is no voice over announcer and the mini is placed to the right of the screen so that you can judge the size of the device with the fourth-generation Apple iPad which is to the left of the screen. 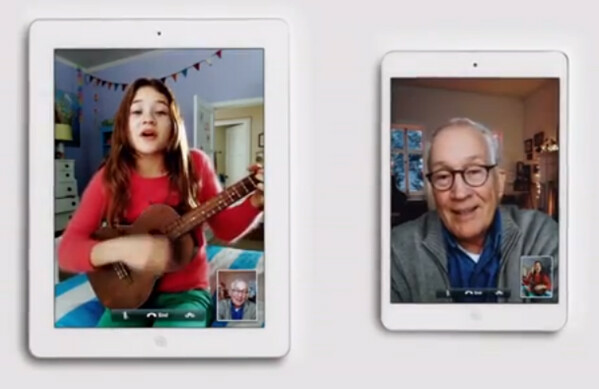 The new Apple iPad mini ad focuses on FaceTime. We see Carly Rose Sonenclar a little girl using her Apple iPad mini to send her performance of "I'll be home for Christmas" to her Grandfather who happens to own the full-sized fourth generation Apple iPad. Which reminds us, this is the first holiday season that you can FaceTime over cellular which means that just about anywhere you go, you can strike up a FaceTime conversation. And with the Scrooges at AT&T not quite reversing themselves, customers of the nation's second largest carrier don't even have to be a Mobile Share member to use the service, but they do have to own an Apple device with LTE connectivity which happens to include the Apple iPhone 5, Apple iPad mini and the third and fourth-generation Apple iPad. WHere have you been Troll? Havent seen you for a few days. Did you get banned? makes me laugh that people overpay for a tablet, and APPLE is laughing, too. Lol, we already see the ads on t.v & YouTube. I see PA writing articles about new Nokia ads, what's so special about this one? nice add and moreover nice piece of pad:) here the competition really bites the dust. A minimalistic ad, a white background, the only things we see are the devices showing off a feature that many other new (and older) tablets can do. 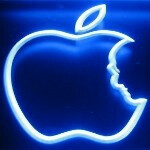 Yep, it's an Apple ad, all right. Same idea as all the others.